The Harvey 1 well was drilled between 7 February and 23 March in 2012 on farmland at Lot 1326 Riverdale Road in Harvey. The site is part of Western Australia’s Swan Coastal Plain which lies to the west of the Darling Ranges, and the well was sunk into the southern part of the Perth Basin. Harvey 1 was a stratigraphic well designed to provide data and core samples from the underlying rock strata. When combined with information from subsequent research projects, this data will be used to build a model of the subsurface formations and to simulate CO2 injection scenarios. Following the completion of the data acquisition program from Harvey 1, the well has been plugged at several levels with cement, capped at the surface and the drill site is being remediated to its previous condition. 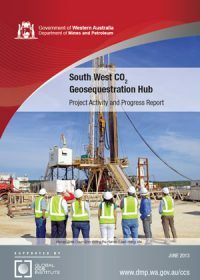 The South West CO2 Geosequestration Hub project is a government-industry partnership presently led by the Western Australian Department of Mines and Petroleum. The South West Hub project was established to examine the options for CCS in the South West of Western Australia (a major industrial region and a significant CO2 producer). In November 2011, the South West Hub project was shortlisted as one of the Australian CCS National Flagship Projects and in June 2011 was awarded AU$52 million under that Program for its ongoing project development. 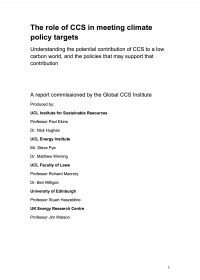 This first Project and Activity Progress report prepared for the Global CCS Institute describes the project’s history, current status, and future program. Furthermore, it highlights key legislative interactions, public communication activities, as well as the challenges and risks the project is currently facing. Future progress reports, anticipated at six-monthly intervals will build on key themes noted in this first report. From time to time additional Special Reports on specific subjects considered important for the development of the South West Hub project will also be made available on the Institute’s knowledge platform.